Product Condition: The Flusso Full-Zip Jersey - Men's is in Excellent condition. This shirt was returned without any tags. It doesn't have any obvious signs of use and there are no defects. Should be like new after a wash. Designed with cooling airflow and quick-drying comfort in mind, the Castelli Men's Flusso Full-Zip Jersey is an ideal choice for training through the dog days of summer. It sports a semi-fitted design that follows your body closely, but isn't a skin-tight race fit. Castelli's Prosecco GT fabric is lightweight and actively wicks moisture away from your skin, helping your body regulate its core temperature when you're exerting yourself on those hot summer days. 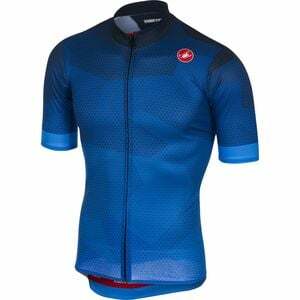 This lightweight polyester fabric is paired with breathable mesh panels along the sides, which channel cooling airflow across your body as you pick up speed.